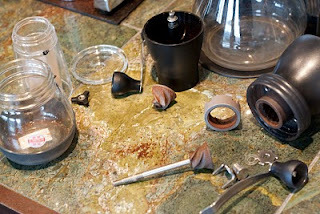 The Skerton is Hario's mid level hand powered grinder. Its primary features are adjustable, conical, ceramic burrs and the $44 price point. From Right, Skerton, Roman and Mini Slim. At first glance, the grinder is shapely. The bean hopper is smokey polycarbonate plastic and its overall shape resembles an hourglass. In my hand it feels stout, in part due to the ground coffee receptacle, a ridged glass bowl that conjures mason jars and lantern globes. Hand grinding coffee is a surprising amount of work and this isn't the first time I've done it. On my first attempt with the Hario, I guessed at a grind setting. I was way off and spent 20 minutes grinding 25 grams of whole bean. I only realized the powder fine setting after I finished and looked inside. It was so fine, I dumped it into the dosing chamber on a Super Jolly and made a shot. I was able to dial the Skerton in and make quality espresso despite a significant time cost. Nevertheless, this grinder performed consistently all the way down to the finest setting. The Skerton suffers from the same simple problem as its competition. The inner burr, driven by the crank, is floating. The inherent side to side play causes for variance in particle size. The benefit is that the deflection protects it from damage if a foreign object finds its way in. After several tries, I got the knack for the cranking technique. The grinder's shape lends it to the in-between-the-knees approach. Sitting down, you hold the grinder between your legs, using them as a brace. The key to consistency in particle size is a smooth, circular action. Not too fast, but not too slow. 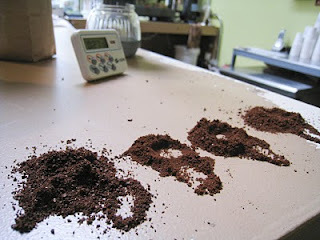 I was able to grind 25 grams for use in the Hario V60 in 3 minutes. Not too bad. The handle is long enough that there's no real resistance. Parts, Mini Slim left Skerton right. There have been complaints online that the open top allows beans to escape the hopper. There is a simple lid modification posted on Home-Barista and this post also attempts to address the floating burr. A simpler solution is to slow down. I get better grinding results this way, anyhow. As I adjusted the grind size toward the larger end of the spectrum, smooth rotation became more and more important. 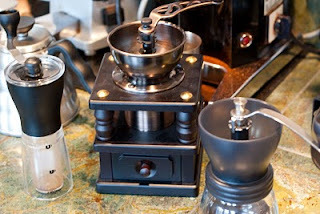 Hario skerton hand grinder from pouredover on Vimeo. Grind adjustment is easily achieved by removing the stop-nut atop the handle. Remove the assembly and turn the star shaped washer. My only complaint surrounds the need to reproduce a grind setting. Eventually I came up with this simple solution: Tighten the grind size adjustment all the way down. Use a Sharpie to make a mark on the star washer and make a corresponding mark on the hopper, the zero point. From this baseline you can easily adjust in whole, half or quarter turns from zero. Grind size in descending order. The same stop-nut used to access the handle and grind adjustment provides easy disassembly for cleaning. The Skerton can survive a ride through the dishwasher. This grinder is attractive, durable and seriously out performs the coffee-pulverizing whirling blade alternative for a very reasonable price. I couldn't be happier. I believe in the effects of a more consistent grind on coffee brewed at home, and the positive results in the cup would go a long way toward making delicious favors more accessible. The firs best use for your right hand is, of course, drinking coffee.